Looking for an exciting new chicken recipe? Just because you are eating healthy, doesn’t mean that your daily menu needs to be boring. Plain grilled chicken and brown rice every day can have you hating your nutrition program. The truth is, you don’t have to be a chef to turn bland chicken into a meal worthy of an Instagram photo. 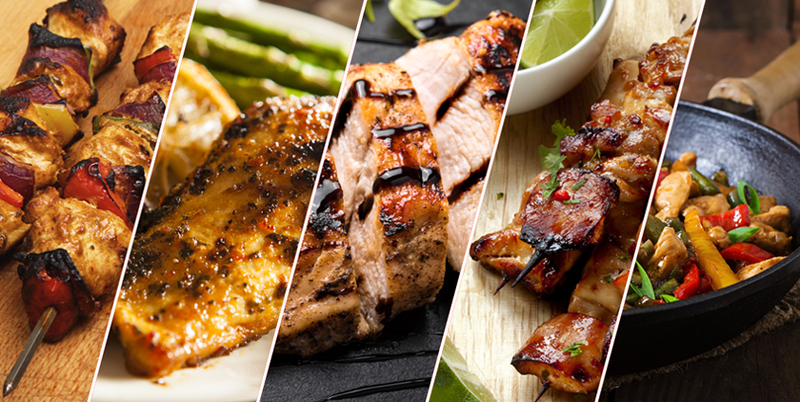 Here are some simple chicken recipes that are healthy, flavorful and can make your nutrition program a lot more enjoyable. This sweet and savory skewered chicken recipe makes a great meal or grab-and-go snack option. In a saucepan over medium heat, mix pineapple juice, coconut milk, brown coconut sugar and ponzu sauce. Remove from heat just before the sauce comes to a boil. Let cool. Place chicken in a Ziploc bag with the marinade and refrigerate for one hour. Discard marinade and place chicken onto pre-soaked wooden skewers. Lightly oil the grill. Grill chicken for 5 minutes per side, or until juices run clear. Garnish with diced pineapple. Easy and flavorful is at the core of this Caribbean-inspired chicken recipe. Preheat oven to 375 degrees. Pound out chicken breasts to an even thickness. Rub with sea salt and jerk seasoning. Cover the chicken breasts with garlic and lemon juice. Place in a non-stick baking dish and bake in oven for 25 minutes or until done and juices run clear. Stir fry is fast, easy and allows for tons of flavor combinations including this citrusy dish that is a deliciously refreshing alternative to a bland chicken recipe. To make the Tangy Sesame marinade, combine all marinade ingredients in a bowl. Trim fat from chicken and cut into cubes. Add to marinade. Cover and marinate at room temperature for at least 20 minutes. Drain chicken and discard the marinade. Put wok on stove on medium heat and add 1 teaspoon of vegetable oil and 1 teaspoon of sesame oil. Add chicken and stir until cooked through. Remove chicken from wok. Add 1 teaspoon of olive oil and a teaspoon of sesame oil to hot wok then put in onions, green pepper, snow peas and carrots; cook and stir for 2 minutes. Add chicken broth to wok and stir for 5 more minutes then throw in kale. Cook for 2-5 more minutes. Return cooked chicken to wok and stir. Serve immediately over rice noodles. Garnish with sesame seeds. This chicken recipe is simple and you can change up your vegetables to add even more variety and flavor. If using wood skewers, put in water to soak before grilling. Clean chicken breasts, cut into cubes and place in a freezer bag. In a bowl, combine olive oil, salt, pepper, paprika, garlic, onions, parsley and white wine. Stir with a fork. Pour marinade over the chicken in the freezer bag and seal. Place the bag in the refrigerator to marinate for 1 hour. Take chicken out of bag and put on skewers with your peppers, onions and zucchini. Grill until the chicken is cooked through and the juices run clear. This chicken recipe has a lot of ingredients and takes time—but it’s super easy and can help you take your spice game up to the next level. Wash, clean and cut your vegetables. Clean and cut your chicken. Place your meat and vegetables into a slow cooker set on high. Stir in your spices. Cover and leave to cook for 4 to 5 hours. For five additional creative and healthy ways to cook chicken, check out: 5 Healthy Ways to Prepare Chicken.